Gates BBQ is quintessential Kansas City BBQ and honorably and permanently appointed with a lifetime contract as the best BBQ in Kansas City and therefore the world. Gates has a deep soulful pit flavor produced by a proud family receipe based franchise that is fantastically urban and ethnic and wonderful. With the help of another local BBQ legend, Gates made Kansas City a BBQ meca that has given our city its wonderful style and taste. Without Gates BBQ, Kansas City would be less than it is today. Several activities define what it is to be Kansas City and the Gates experience is certainly one of those rights of passage. Unlike many of the soulless tourist trap offerings of admirable BBQ rivals, Gates has roots. Gates is consistent with predictable and dependable BBQ staple delights. Gates earned is permanent spot on the BBQ pedestal mostly because they have the most unique BBQ sauce ever created. A sauce that flows freely from a spigot for dine in eaters and not hidden behind a counter like at Q39. Gates unique sauce and pit style hickory wood smoked meats are truly this City’s most sacred but oddly underappreciated treasure. Gates remains oddly affordable, unlike Char Bar, their beef on bun with drink will keep you at a $10 lunch tab. The dining options at Gates are endless but their traditional sandwiches are mouthwatering. 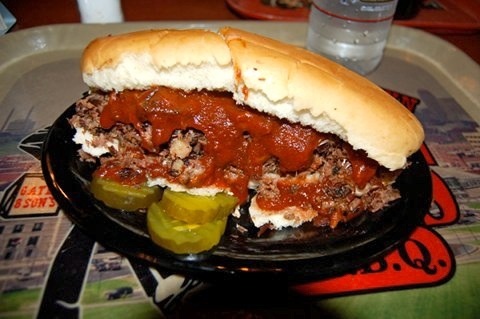 Beef-&-a-half sandwich or the chopped burnt ends on bun is a personal favorite. These BBQ sandwiches are the cornerstone for the entire BBQ universe. Gates prepares their meat either sliced thin or chopped, which pairs well with a saucy finish. Ribs are also wonderful and their sausage is a craveable menu alternative.